We've been serving Metro Downtown Atlanta for over 18 years. It's our home and backyard. We're also working hard to reach more cities outside the perimeter. 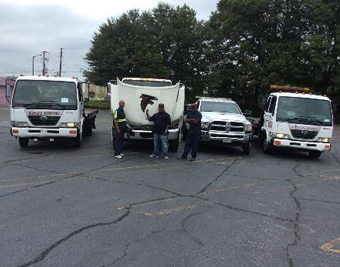 King's Towing Downtown Atlanta has been in business for 18 years with our head quarters located at our Downtown Atlanta Facility and we service other locations like Midtown, Downtown and All Metro Downtown Atlanta. King's Towing Downtown Atlanta's extensive experience in light, medium, and heavy duty towing services plus an outstanding safety record we pride ourselves in. King's Towing Downtown Atlanta also offers tire changes, auto battery jumpstart, car door unlocking, gas delivery with fast response times. King's Towing Downtown Atlanta billing terms is payment upon completion of service and we accept all major credit cards. © Copyright. All rights reserved Kings Towing Downtown Atlanta, GA.